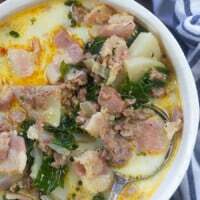 Zuppa Toscana made low carb! My family had NO IDEA that I swapped the potatoes for sliced turnips – they take on all the flavors of the soup and the texture is just like a potato! This low carb soup recipe will be a total hit with the whole family. Would you believe that I was an adult the first time I ever ate at an Olive Garden? Why in the world did my parents shield me from the deliciousness when I was a kid?! Believe it or not, I still eat there every now and then. I usually go for a salad and chicken Alfredo – I just ask them to replace the pasta with steamed broccoli and they’re happy to accommodate! 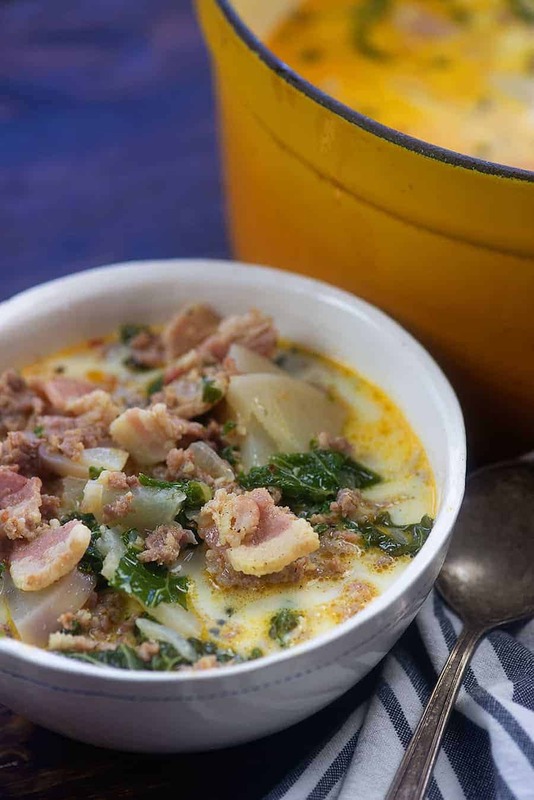 I totally miss the Olive Garden Zuppa Toscana recipe though. It’s one of my favorite soups to eat at a restaurant. Unfortunately, it’s loaded with carbs thanks to the flour they use as a thickener and the thin slices of potatoes. 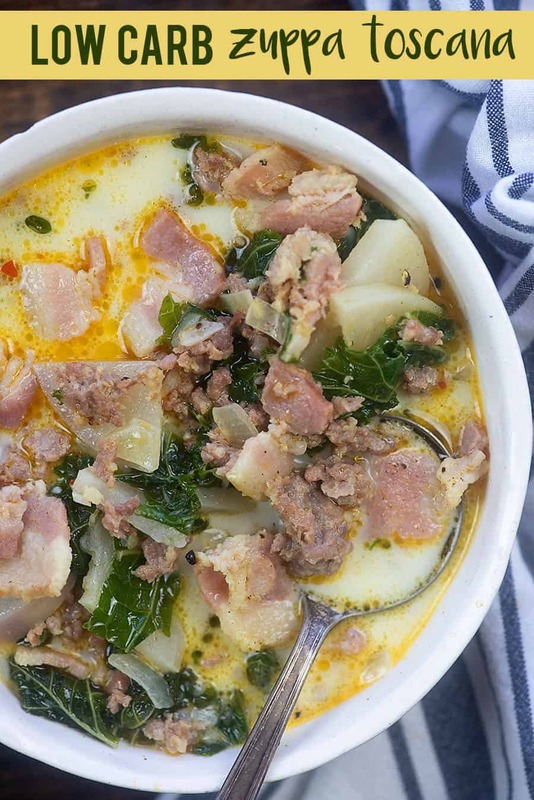 This zuppa toscana copycat will satisfy any craving though. I served this to my family and they had NO IDEA they were eating turnips instead of potatoes. I call that a win. 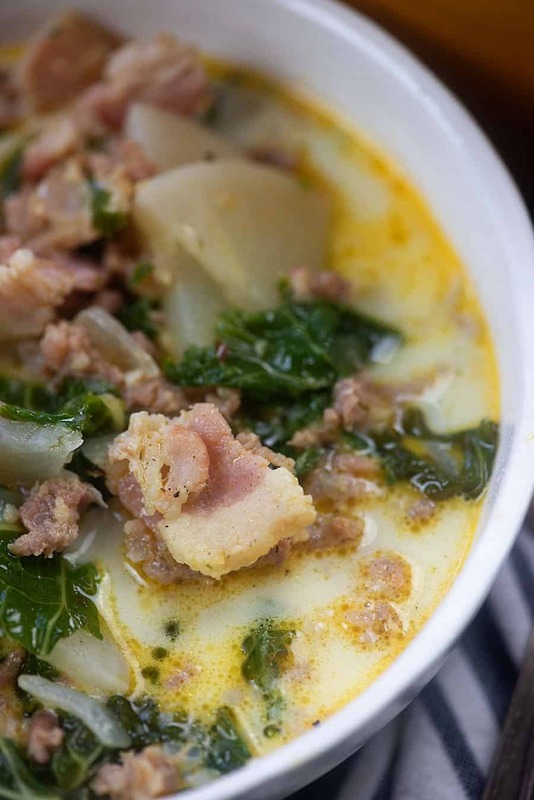 I hope you guys give this zuppa toscana with turnips a try and let me know what you think. First up, we’re going to brown some Italian sausage. I like to use a spicy variety, but you can use mild if you prefer. If you do use mild, I’d recommend just adding in a little sprinkle of red pepper flakes. That way you get the traditional heat, but you can control how much. Once your sausage is beginning to brown, stir in some chopped raw bacon, diced onion and minced garlic and cook those up. The bacon won’t get crispy, but it will cook through as we finish off the soup. It adds a great flavor! Next comes your chicken broth and turnips. Bring that to a boil, reduce to a simmer, and cook for about 10 minutes. Add in the kale and let that cook for about 5 minutes. The kale and turnips should be nice and tender. Isn’t it so pretty and colorful? That’s it, friends! 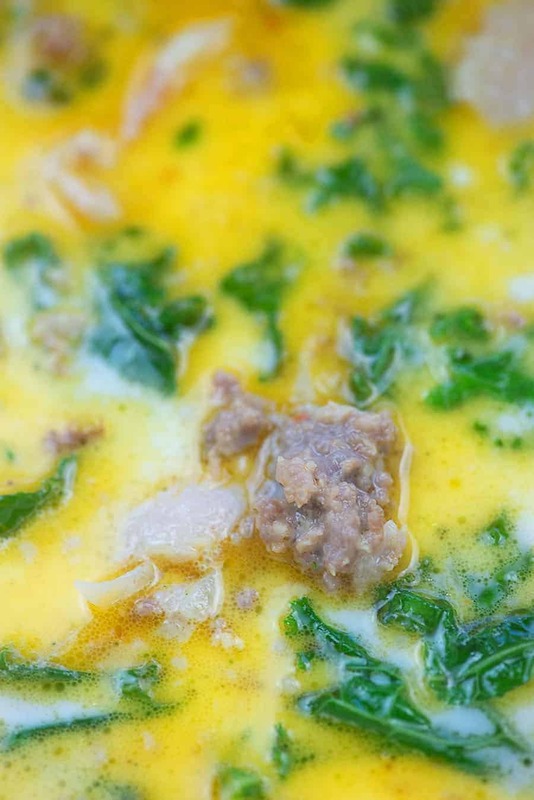 This zuppa toscana recipe is ready to devour! Low Carb Alfredo Sauce: We serve this over broccoli! Spaghetti Squash Casserole: Layers of spaghetti squash, meat sauce, and loads of cheese. Pork Tenderloin: It’s topped off with garlic butter! Mozzarella Stuffed Meatballs: Meatballs that are stuffed with gooey mozzarella and then topped off with marinara! Baked Shrimp Scampi: Sheet pan dinners are so easy and this one is no exception! 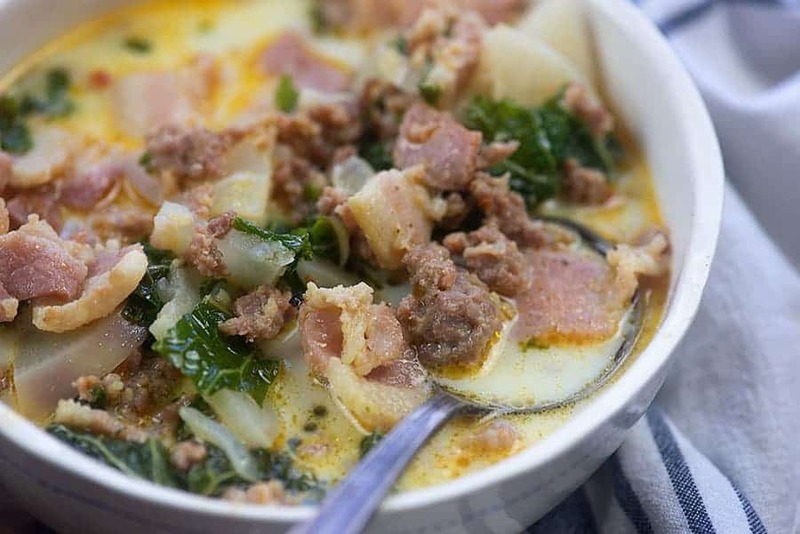 Zuppa Toscana - just like at Olive Garden but without all the carbs. My family had no idea they were eating turnips instead of potatoes in this low carb soup recipe! Heat a large sauce pot or dutch oven over medium heat. Add the Italian sausage to the pot and begin to brown the meat, breaking it up as it cooks. 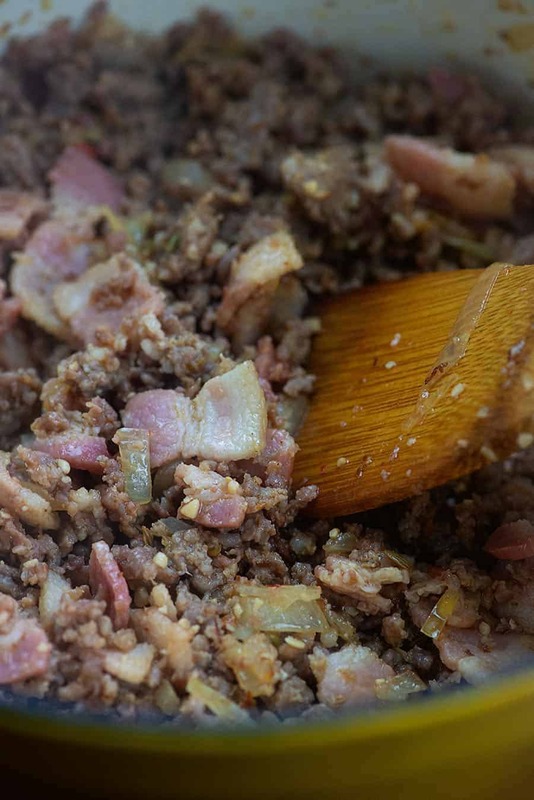 When the meat is about halfway browned, add the bacon, onion, and garlic and continue cooking and stirring until the sausage is fully cooked through. Add the chicken broth and turnips and bring to a boil. 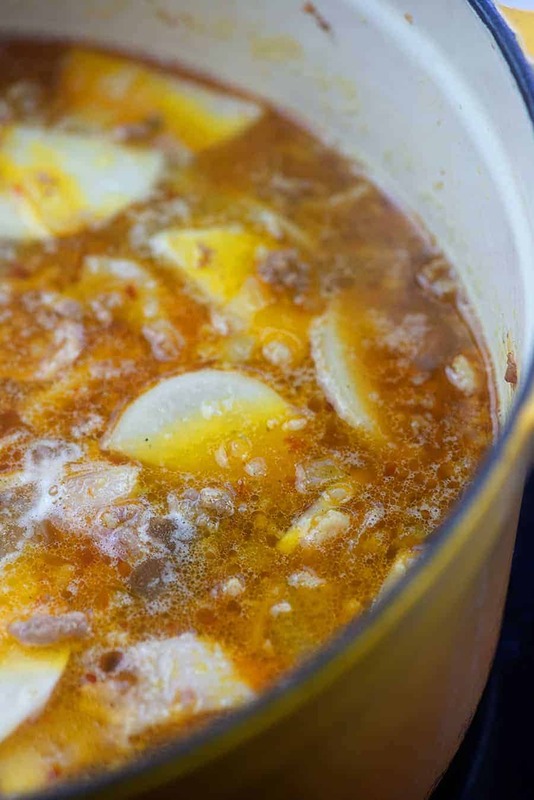 Reduce heat to a simmer and cook for 10 minutes. Add the kale and continue cooking for 5 minutes or until kale and turnips are both tender. Remove from the heat and stir in the cream. Taste and add salt and pepper as needed. You may use spinach in place of kale if you prefer. Oh my goodness! I can’t tell you how happy I am about this! I have been craving this soup but have been trying so hard to be good! THANK YOU!!! I will be making tonight! Karly, this soup looks amazing! I just want to cozy up on the couch with a blanket and a big bowl of this soup! I make this with turnips too and my family cant even tell the difference! It has been a life changer since I discovered turnips! I also make mashed cauliflower on the side and add as a thickener!! I can’t wait to try this! Has anyone tried turnips instead of when cooking a roast? I’ve used radishes, but haven’t tried turnips yet. I’m sure they’d be good though! OMG, this is so good. Even my picky Fiance brought a bowl to work for lunch. It’s amazing. Thanks for the recipe! Made this tonight. Love it! My family was impressed and said to put it on the “definitely make it again” list. Cannot tell you exactly how much I love this soup!! I have missed having it do to the potatoes. WOW….I like this version even better!!! The slight bite of the turnip, the creaminess it adds, the way it holds its shape while giving a velvety texture! Definitely on the top of my rotation, for sure!! 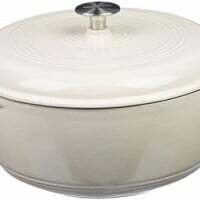 What are the cooking instructions for a slow cooker? Or can’t this be done in one? I’ve not tried this one in a slow cooker yet. I think that would work fine, though I haven’t tried it.